We have raised most of the different varieties of heritage turkeys since 2002, including royal palms, bourbon reds, slate, lavenders, Narragansetts, and Spanish blacks. For the past few years, we raised Royal Palms because they are easy to process on farm ourselves due to their smaller size, although we do still use a USDA certified processing plant for turkeys that we sell. In 2010 and 2011, we raised White Holland turkeys. Although they are white like supermarket birds, they are a heritage breed and are more scarce than slates, bourbon reds, black Spanish, or standard bronze, which we have also raised. We usually stayed away from white poultry because they’re a blinking beacon for predators, but we raised the Holland turkeys in moveable pens, also known as chicken tractors. 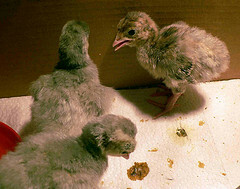 From 2006 to 2008, we raised blue slate heritage turkeys. We have previously raised bronze, royal palm, and bourbon red turkeys, and we even started raising Narragansetts once, but we lost all 25 to predators. We started with bourbon reds and blue slates in 2002, but due to the docile nature of the slates, the bourbon red gobblers kept trying to kill the slate gobbler. After nursing him back to health twice from a near-death experience, we think he was either brain damaged or intimidated to the point that he would no longer mate the females. Finally, we gave him to someone who just wanted a beautiful tom turkey strutting around her yard. 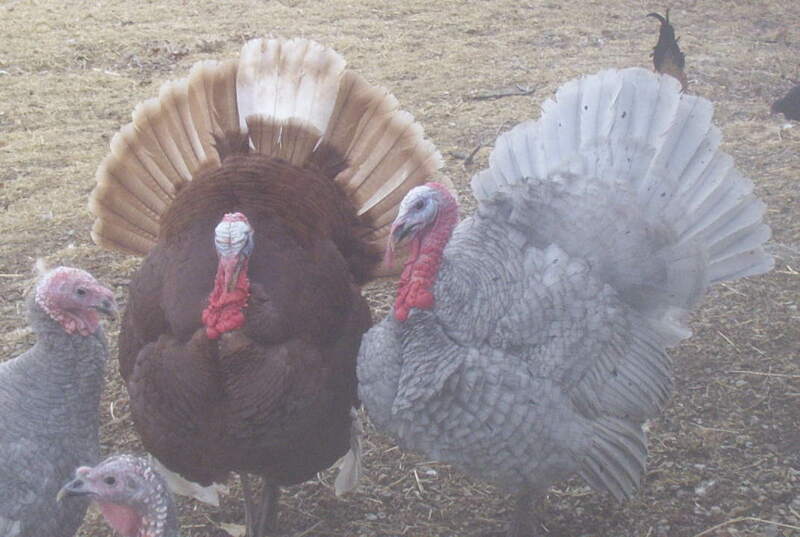 Without a slate gobbler, we focused on breeding the bourbon reds for a couple of years. But then when we saw that the bourbon reds had graduated from the endangered list to a watch list, we decided to return to our first “true love” – the blue slate – because it was still critically endangered. After the slate has increased in numbers, we decided to focus on the white Hollands for a couple of years. I fell in love with the heritage turkeys the first time I saw them, and I thought the blue slate and lavender were the most beautiful. (Blue slates have a few black spots scattered through their feathers, whereas the lavenders are pure blue.) They are much lovelier than the broad-breasted white turkeys that are raised by the millions on factory farms. They can run and fly, and they can breed naturally — things that modern turkeys cannot do! Yes, that means supermarket turkeys are all the product of artificial insemination. Heritage turkeys graced dinner tables in this country for many generations until the 1950s. 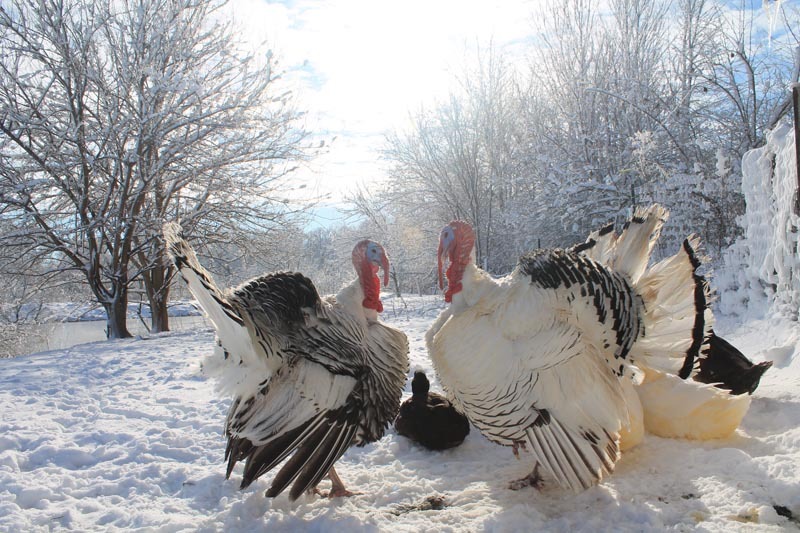 It is written that Abraham Lincoln received Narragansett turkeys as gifts on several occassions. Unfortunately, heritage turkeys were in danger of extinction less than a decade ago — fewer than 2,000 could be found in the entire United States — because factory farms only raise the broad-breasted (also known as double-breasted) white turkeys that were developed in the 1950s to grow bigger, faster, and cheaper. Small family farmers and organizations such as Slow Foods and the American Livestock Breeds Conservancy took an interest in these beautiful animals, realizing that the way to save a rare bird is to create a market for it! Chefs in New York, Los Angeles, and Chicago have done side-by-side taste comparisons between the factory-farmed big boys and the heritage turkeys and unanimously declared the heritage turkeys to be moister and tastier. What's the difference between the different breeds of turkeys? A heritage turkey is defined by the Livestock Conservancy as one that can fly and can mate naturally. Supermarket turkeys (broad-breasted whites) can’t do either of those things, because their breasts are too large. Heritage turkeys also come in a variety of colors, as well as white. It is important to understand that color does not make a heritage turkey. There are broad-breasted bronze turkeys that cannot fly or mate naturally, and there are standard bronze turkeys that can do both. There are also white turkeys that can fly and mate naturally, but the modern white commercial turkey cannot. One of our favorite heritage turkeys, the lavender (a variety of the blue slate), is listed as Critical by the Livestock Conservancy, as is defined as “Fewer than 500 breeding birds in the United States, with five or fewer primary breeding flocks (50 birds or more), and globally endangered.” We have raised most of the different varieties of heritage turkeys since 2002, including royal palms, bourbon reds, slate, lavenders, and Spanish blacks. How 'natural' are these turkeys? Are chemicals used to dissolve the feathers, or are they injected with anything to make them juicy? No chemicals are used in the processing of these turkeys, and they are not injected with anything. They are fed grain, and they also eat whatever grasshoppers and caterpillars they find in the pasture, as well as grass, weeds, and fresh garden vegetables that are never sprayed with anything.. I've never had a heritage turkey before; how do I cook it? You can cook it however you want! Yes, we’ve seen all sorts of complicated cooking instructions for them, including the one where you cut it up before cooking, but being old-fashioned, we think that ruins the presentation! We simply roast ours in an open pan in the oven. When it starts to look brown, we check the breast meat with a thermometer, and if it’s not 160 degrees yet, we put aluminum foil over it, and return it to the oven so it can continue cooking without browning more. When are turkeys available to purchase for Thanksgiving? Because we are a small family farm, we only process turkeys once a year, usually a few days before Thanksgiving. If you want a turkey for another upcoming holiday, we suggest that you order a second (or third) turkey for that occasion and freeze it. It is not unusual for our customers to get more than one turkey for that reason. How soon should I send you a deposit? As soon as possible, especially if you want a turkey larger than 10 pounds. The biggest turkeys get reserved first. We start taking reservations in March.